GranDracmon is a Demon Beast Digimon and a carrier of the X-Antibody Factor : GranDracmon in its Digicore. The name and design are derived from "Grand Dracmon". 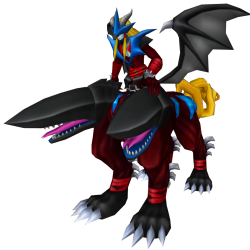 It is considered the king of vampire Digimon. It has kept a castle in the Dark Area since ancient times, and it boasts of such power that even the Seven Great Demon Lords cannot interfere with it. It has a gentlemanly demeanor, and because of the "Charm" effect within the voice it exudes, it has tales that can lead any Angel Digimon who comes to subdue it into falling down. It is told that it possesses an undying body, and although it is said that is connected to the details of how the Dark Area came to be within the Digital World, or that it knows the truth of the mysterious evolution, "Death-X", because it's difficult just to struggle your way to the castle, you'd have to say that questioning it about these mysteries would be extremely arduous. Eye of the Gorgon Pitch Black attribute 2 seconds cooldown 48 DS consumed skill points per upgrade Learned at Lv. Crystal Revolution Pitch Black attribute 8 seconds cooldown 184 DS consumed skill points per upgrade Learned at Lv. This page was last modified on 4 January 2019, at 12:59.